Oral hygiene behaviors differ greatly among regions, countries, and even within countries. These differences may be related to race/ethnicity, socioeconomic status, cultural contexts including beliefs, values, and myths on oral health. Different oral hygiene behaviors result in different oral health outcomes across the globe. For example, high levels of caries experience (i.e., 14 teeth or more) are seen in developed countries and some countries of Latin America, whereas the prevalence of caries is much lower in the developing countries of Africa and Asia. Oral diseases such as dental caries are linked to complex chain of sociobehavioral risk factors existing within the broader socioenvironmental contexts. There have been many studies observing the associations between dental caries and sociobehavioral risk factors in industrialized nations, but data from developing nations have only been published recently with a paucity of information still existing in socially marginalized groups in low- and middle-income countries.,, Comparing two geographically different rural populations of Dominican Republic (DR) and India will not only add to the existing knowledge on sociobehavioral risk factors of dental caries in lesser-known populations in middle-income countries but also give an insight on how sociobehavioral and environment risk factors result in different levels of caries experience. DR, a Latin–Caribbean country and India, a South Asian country differ vastly in geography, demography, and sociocultural norms. The differences between the two nations are also reflected on their oral hygiene behaviors affecting oral health status. For example, use of tobacco and areca nut for recreational and therapeutic purposes is widely prevalent in rural regions of central India resulting in high prevalence of abrasions, dental caries, periodontal diseases, and oral lesions. On the other hand, consumption of refined starchy food and sugary drinks is more common in DR leading to high prevalence and severity of dental caries., Despite several differences found between these two populations, some similarities do exist with respect to seeking dental care: one of the main reasons for seeking dental care among rural populations is orodental pain when dental diseases have progressed in severity. The comparisons between the two nations will identify some differences and similarities with respect to behaviors pertaining to oral health that could aid in the development of culturally tailored oral health prevention and promotion programs matching the need for care of target populations. What is the prevalence of dental caries among rural adult participants? What are the differences in oral hygiene behaviors and caries experience (decayed, missing, and filled teeth [DMFT] index) between two developing nations: India and DR? The purpose of the study is to gain integrative knowledge on oral hygiene behaviors affecting the levels of caries experience that will help in the development of oral health interventions for specific groups of people in India and DR that are culturally different. The participants for the study were recruited in two countries: La Esquina community, Province Maria Trinidad Sanchez in DR and in Ramgarh, district Chhindwara in the state of Madhya Pradesh in India. A total of 104 aged 18–80 years participated in the study in DR with a population of 350 (based on the population size of 350, confidence level of 90% and margin of error of 6.7, and the estimated sample size was approximately 104) while a total of 202 participants aged 18–85 years participated from a population of 800 in rural central India (based on the population size, confidence level of 90% and margin error of 5%, and the estimated sample size was 202 adults). Before conducting this study, approval was obtained from Institutional Review Board of a Texas University. This cross-sectional study invited residents older than 18 years to take part. Only after having signed their informed written consent, they were allowed to answer survey questions on their oral hygiene behaviors, daily habits, and dental visits through face-to-face interviews as well as participate in screening or intra-oral examinations. While Spanish is spoken by the Caribbean participants, Hindi was the native language of the rural subgroup in India. The questionnaire, adopted from the WHO oral health questionnaire for adults, was translated into the Spanish and Hindi by qualified translators, respectively. The questionnaires were then translated back to English to check if there was any loss of meaning or context in the translation process. The survey was administered by research teams that went door-to-door and respondents answered the questions or underwent screening in their front yards or porches. A single-trained dentist carried out the intra-oral examinations in both the regions. A total of 12 and 25 participants were reexamined in DR and India and intra-examiner reliability (Kappa statistics) was 0.9 and 1, respectively. The study collected information on demographic variables such as gender, age, and educational levels. Age was noted down as age at last birthday. In instances where participants in rural India did not recall age or birth year accurately, age in those cases was estimated based on major life events such as their wedding year or the birth years of their children. Educational level was categorized as having some elementary school education, having more than elementary school education including some years in college, and having no formal education at all. While the two studies collected information on several variables, 4 questions on oral hygiene behaviors, 3 questions on daily habits, and 2 questions on dental visits and attitude toward professional dental care were included for the comparison between the two different nonrandom samples. Survey questions pertaining to oral hygiene behaviors, daily habits, and past dental visits were adopted from the WHO oral health questionnaire for adults. The questions were in multiple choice question format and participants had to choose the best possible answer. Due to low literacy levels, questions were read out to them and their responses were recorded by the research team. In addition, participants were also examined for teeth that were decayed, filled, or lost because of caries. The data were analyzed using Statistical Package for the Social Sciences 22 (SPSS, Chicago, IL, USA). Frequency distributions of the various demographics in each sample were obtained. Chi-square statistics were obtained to examine the distributions and differences in oral hygiene behaviors and daily habits by the two countries. T-test was performed to determine differences in the mean scores in the overall caries experience (DMFT score) between the DR and India samples. [Table 1] shows the distribution of the study populations according to gender, age, and educational levels. The samples in rural India and DR had fewer males than females. Males comprised 44.1% while females made up 55.9% of the sample in India. In the DR sample, males were 47.1% while females were 52.9% of the total participants. The age distribution between the two samples was statistically significant (χ2 = 9.03, P = 0.011). The majority of the sample in India was between the ages 18–34 years (50.8%), followed by 45 years and above (26.7%) and 22.6% between the ages of 35–44 years. The DR sample had more participants above the ages of 45 years (44%) followed by participants between the ages of 18–34 years (40.8%). Only 15.3% of the sample was between the ages 35–44 years. While all of the participants in DR had some level of formal education, 8.2% of the Indian participants were illiterate. Of the participants that had some form of formal education, there were nearly equal numbers of participants with <8 years or >8 years of education in India. However, a majority, 60% had 8 years or <8 years of education and 40% had more than 8 years of education in DR. The difference in the educational levels was statistically significant across the two samples (χ2 = 16.24; P < 0.001). The differences in the oral hygiene behaviors in India and DR are shown in [Table 2]. 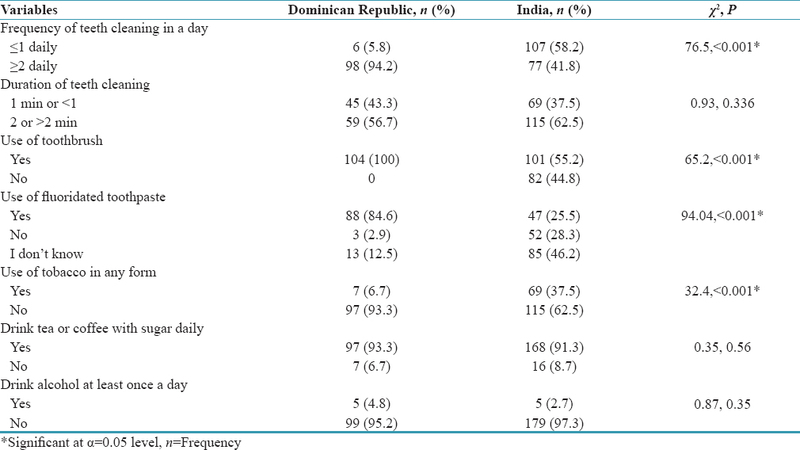 While about 94% of the Caribbean sample brushed more than twice daily, brushing twice daily was not as common among Indian participants with only 42% practicing this oral hygiene behavior. More than half (58.2%) of the Indian subgroup brushed only once a day, and this difference in brushing habit was statistically significant between the two geographically different samples (χ2 = 76.5; P < 0.001). Greater proportion of both the Latin Caribbean and the Indian participants brushed for 2 min or more; however, this difference was not statistically significant. Use of toothbrush had marked difference by the samples examined. All of the participants in DR used toothbrush for teeth cleaning purposes, while only 55% of the Indian subgroup used toothbrush. Other Indian participants used chew sticks or fingers for cleaning. This difference in oral hygiene behaviors was found to be statistically significant between the two samples (χ2 = 65.2; P < 0.001). More use of fluoridated toothpaste was reported in the DR sample with this difference being statistically significant by the two countries (χ2 = 94.04; P < 0.001). Nearly 75% of the Indian subgroup did not use fluoridated toothpaste or was not knowledgeable that their toothpaste was fluoridated. Use of tobacco was more prevalent in the rural Indian subgroup where people used tobacco in more than one forms. About 38% reported either chewing tobacco or smoking, while use of tobacco in the DR sample was only in the form of cigarettes with only 7% reported doing so. This daily habit was statistically significant by the two groups (χ2 = 32.4; P < 0.001). Drinking sweetened tea or coffee was widespread in both the groups with 91%–93% reported consuming them at least once a day. This difference was statistically not significant. Daily alcohol consumption was not very common in both the samples with only 5% of the DR participants and 2.7% of the Indian subgroup reported drinking alcohol daily; the difference in this daily habit was not found to be statistically significant between the two countries. [Table 3] illustrates the attitude of the participants toward seeking professional dental care and the utilization of dental services in the past 1 year. On being asked if going to the dentist was necessary despite the absence of dental pain, about 95% of the Latin–Caribbean sample said yes, while only 39% of the Indian subgroup agreed to the statement. This difference in the attitude toward professional dental care was statistically significant across the two groups (χ2 = 85.07; P < 0.001). The dental visits in the past 1 year for the rural Indian participants were very few with only 12 participants reported doing so, while 29 of the 104 DR participants visited the dentist in the last year. This difference in the utilization of dental care and services was statistically significant between the two samples (χ2 = 24.84; P < 0.001). Intra-oral examinations of the participants to determine the prevalence of caries was carried out in the two subgroups. The overall caries experience is quantified by summing up the number of teeth decayed, missing, and filled as a result of caries. The caries experience was much higher in the Dominicans with a DMFT score of 9.6 ± 8.0 than in the rural Indian group which had a mean score of 4.0 ± 5.7. This difference in the mean was statistically significant across the two groups (t statistic = 3.65; P < 0.001). Similarly, the numbers of teeth decayed, missing, and filled were higher in the Latin–Caribbean group than India's rural group. The mean decayed teeth score in the DR sample was 3 ± 2.7, while the mean decayed teeth among rural Indians were 2 ± 2.2. Dominicans had an average of 6 missing teeth (6 ± 8.7), while Indians had an average of two missing teeth (2 ± 5.5). The filled teeth score was 0.6 ± 2 and 0.02 ± 0.2 for Dominicans and Indians, respectively. The differences in the individual component scores were found to be statistically significant across the two groups [Table 4]. Of the daily habits that affected oral health outcomes, use of tobacco either in the form of beedis or cigarettes or chewing tobacco mixed with lime, catechu, and areca nut was prevalent in the Indian sample with more males reported using tobacco in one form or the other. Tobacco was also present in indigenously manufactured dentifrices that were used by both males and females alike. People believe that tobacco containing dentifrices aid in alleviating tooth pain and their continual usage makes them addicted to tobacco.,, Tobacco in the form of cigarettes was seen in the DR sample, and a small proportion of the sample smoked. Consumption of sweetened tea was widespread in India, while consumption of sweetened coffee was prevalent in the Dominican sample. While the frequency was not very high with slightly more than 90% reported drinking only once daily in both the samples. One of the studies showed higher prevalence of sweetened tea in rural India and associations of dental caries levels with higher tea consumption frequency. Alcohol consumption on a daily basis was not a common daily habit in both the samples with less than 5% of the subgroups reported using alcohol. More proportion of Latin–Caribbean participants visited the dentist in the last 1 year. While fewer participants sought professional dental care in rural India, the main reason for dental attendance in both the sample was dental pain. Even though the Caribbeans reported positive attitude toward professional dental care, it may be speculated that several factors prevent them from seeking timely dental care. It is well known that people usually seek dental treatment either when the disease has progressed in severity or when pain becomes unbearable. Furthermore, restorative treatments are expensive for rural people where almost all of the dental payments are out-of-pocket. Treatment is sought in private dental offices where they are charged more if undergoing restorative treatment in the initial stages of dental caries than for tooth removal that remains the only inexpensive option in advanced stages of dental decay. Although government-owned hospitals charge less, they are not equipped with resources or dental professionals for restorative treatment. Dental care is usually private service offered in urban or semi-urban areas; traveling to seek treatment is cost prohibitive to a majority of participants in both the countries. Furthermore, oral health is perceived not as important as general health; oral conditions are usually not life-threatening, so people usually self-manage their conditions before seeking any professional help. Some barriers such as fear of instruments, loss of vision following tooth removal prevent them from using dental care even if available.,, Losing teeth is seen by many in both the rural communities as a natural order of the aging process. The overall caries experience was higher among Dominicans with both the missing and decayed teeth component also being higher than the Indian participants. The high DMFT index among the Dominicans was attributed more to the missing component than to the decayed or filled components. The mean number of teeth filled was higher in the Latin–Caribbean subgroup too indicating that access and affordability to some forms of restorative treatment were more commonplace in rural DR than in India. The unmet treatment needs demonstrate limited access to dental health care and a need for the provision of dental health services within the existing health infrastructure in the rural communities. The oral hygiene behaviors in the Indian subgroup were not optimal for good oral health, yet the caries experience was lower than the DR sample which reported higher use of fluoridated toothpaste. It can be attributed to the high fluoride levels that are found in potable water. Existing literature shows naturally occurring fluorides in groundwater are above the permissible amounts and are estimated to be above 10 ppm (parts per million). Salt fluoridation that has begun in DR has not yet permeated into this small rural community of 300 people. The self-reported topical use of fluorides through toothpastes was inadequate to provide protection against dental caries. Observations and intra-oral examinations among the Dominican sample suggest that caries process initiated at very young ages among these adult participants when oral hygiene behaviors (brushing techniques, duration, and frequency) may not have been optimal despite the self-reported use of fluoridated toothpaste. While we have no information on the fluoride histories on this adult sample in DR and speculations among participants while answering use of fluoridated toothpastes further limits our understanding, it is well known that the action of fluoridated toothpaste on large carious lesions or in the acidic environment becomes limited. In addition, consumption of sugary and starchy foods was common among adolescents and young adults in rural Dominicans. On the other hand, even though Indian sample had suboptimal oral hygiene behaviors, high levels of fluoride in potable water that these participants were exposed to since their childhood, lesser frequency of in-between meals snacking habits due to limited resources, and use of areca nut with paan (betel leaf) chewing offered some protection toward caries initiation and development. Primary health centers do not address the topic of oral health, and there are no dental professionals that work in rural areas in this region of India. Community health workers such as Anganwadi workers and helpers or other rural health workers such as Accredited Social Health Activists in India are not trained in providing oral health education in Indian villages., Similarly, oral health education is not a part of health education programs in DR which usually focus on zoonotic and chronic diseases. Given the considerable prevalence of dental caries, oral health education, and essential oral health delivery in developing nations should become a part of the existing primary health care in rural communities where rural health workers should be trained to deliver oral health education programs and dental auxiliary professionals be utilized more in offering essential dental services in rural regions. While this is first among the studies comparing oral hygiene behaviors, dental attendance, and oral health status between two culturally and geographically different countries, sample sizes are small limiting some of the implications that can be drawn from the study. Nonetheless, an insight into oral hygiene behaviors and daily habits will help in tailoring oral health education and promotion programs to the populations' needs. Anti-tobacco health education programs in addition to promotion of use of toothbrush and paste will help improve the oral health status among India's rural while ways to improve oral hygiene to achieve optimal oral health through the lives should be the focus for oral health education programs in DR. While all the questions pertaining to oral hygiene, daily habits and dental visits were self-reported, some information bias may have been incorporated as self-reports are imperfect indicators of behaviors. Social desirability may have played a role in ways in which participants answered certain oral hygiene behaviors. In addition, the missing component in the DMFT scores become invalid as age advances and may have been overestimated as this solely relied on participants' recollection on how they lost their teeth which may have been due to noncaries-related causes too. The cross-sectional study design does not explain the cause and effect between modifiable risk factors and levels of caries. More comparative studies are needed to build on the study findings. There were significant differences in a few oral hygiene behaviors, daily habits, and levels of caries experience between the Dominican and Indian subgroups. The integrative knowledge on oral hygiene behaviors affecting the levels of oral diseases in these two different countries could aid in the development of oral health interventions for specific groups of people in India and DR who are different in several ways. The two studies were partially funded by College of Education and Human Development, Texas A&M University. These studies were presented at the National Oral Health Conference, Albuquerque, New Mexico, USA. Buunk-Werkhoven YA, Dijkstra A, Bink P, van Zanten S, van der Schans CP. Determinants and promotion of oral hygiene behaviour in the Caribbean and Nepal. Int Dent J 2011;61:267-73. Petersen PE. Sociobehavioural risk factors in dental caries-international perspectives. Community Dent Oral Epidemiol 2005;33:274-9. Chen M. Oral health of disadvantaged populations. In: Cohen LK, Gift H, editors. Dis Prevent and Oral Health Promot: Socio-Dental Sci in Action. Copenhagen: Munksgaard; 1995. Manuc D, Bulgaru S, Iancu LS. International perspectives on correlation of socio-behavioral risk factors with dental caries. J Prev Med 2006;14:46-59. Tisone C. The Relationship Between Family Health Care Practices and Child Growth in the Dominican Republic. Bloomigton: Indiana University; 2004. Peterson PE, Baez RJ. Oral Health Surveys: Basic Methods. France: World Health Organization; 2013. Madden IM, Newman H, Hall C, Brading MG, Ketkar V, Bidinger PD, et al. Sustained oral health improvement and use of toothbrushes and dentifrice by previous users of traditional materials in a rural population in Andhra Pradesh, India. Int Dent J 2004;54:315-20. Mohire NC, Yadav AV, Gaikwad VK. Current status of oral hygiene: A clinical survey report. Res J of Pharm Technol2009;2:274-82. Schwarz E, Lo EC. Dental health knowledge and attitudes among the middle-aged and the elderly in Hong Kong. Community Dent Oral Epidemiol 1994;22:358-63. Tewari A, Gauba K, Goyal A. Evaluation of existing status of knowledge, practice and attitude towards oral health of rural communities of Haryana – India. J Indian Soc Pedod Prev Dent 1991;9:21-30. Agrawal SS, Ray RS. Nicotine Contents in Some Commonly Used Toothpastes and Toothpowders: A Present Scenario. of Toxicol 2012. Available from: http://www.dx.doi.org/10.1155/2012/237506. [Last accessed on 2017 Jun 01]. Simpson D. India: Tobacco toothpaste squeezed out. Tob Control 1997;6:171. Bhawna G. Burden of smoked and smokeless tobacco consumption in India – Results from the global adult tobacco survey India (GATS-India)- 2009-201. Asian Pac J Cancer Prev 2013;14:3323-9. Maru AM, Narendran S. Epidemiology of dental caries among adults in a rural area in India. J Contemp Dent Pract 2012;13:382-8. Kahar P, Harvey IS, Tisone CA, Khanna D. Assessment of oral health knowledge, attitude, utilization and barriers toward professional dental care among adults in central rural India. Oral Health Dent Mang 2016;15:2. Kahar P, Tisone CA. Assessment of oral health knowledge, practices and attitudes toward oral health and professional dental care among rural population in the Dominican Republic: A cross-sectional study. Int J of Dent Health Sci 2015;2:27-38. Garcha V, Shetiya SH, Kakodkar P. Barriers to oral health care amongst different social classes in India. Community Dent Health 2010;27:158-62. Thakur JK, Singh P, Singh SK, Bhaghel B. Geochemical modelling of fluoride concentration in hard rock terrain of Madhya Pradesh, India. Acta Geol Sin 2013;87:1421-33. Estupiñán-Day S. Promoting Oral Health: The use of Salt Fluoridation to Prevent Dental Caries. Washington D C: Pan American Health Organization; 2005. Lussi A, Hellwig E, Klimek J. Fluorides-mode of action and recommendations for use. Schweiz Monatsschr Zahnmed 2012;122:1030-42. Integrated Child Development Services (ICDS) Scheme. Ministry of Women and Child Development Website. Available from: http://www.wcd.nic.in/icds/icds.aspx. [Last accessed on 2017 May 24]. About Accredited Social Health Activist (ASHA). National Health Mission Website. Available from: http://www.nrhm.gov.in/communitisation/asha/about-asha.html. [Last accessed on 2017 May 24].